fluidized system in the cargo holds but differ in loading/unloading technologies. The world fleet comprises almost 300 vessels from 2,000dwt up to 30,000dwt for seaborne cement transportation and domestic cement supply with the majority being in the 5,000 < 10,000dwt and 10,000 < 20,000dwt range (see Fig. 1 on p38). Over the years, the fleet has aged considerably and now about 40% of the fleet is older than 28 years. The average age of these vessels is 24 years, the average deadweight is 8,200dwt. Trends are changing. New cement terminals for the growing domestic supply have encouraged cement traders and ship owners to invest in new buildings and convert bulkers to self- unloading carriers. In addition, the top charterers have changed their policy and limit the age of vessels to 25 years. Investment decisions are becoming more and more professional. Whereas, in the past, buying decisions were mainly based on the capital investment, now systems reliability, operational costs and maximum utilization of the ship’s hold volume are taken into account. Shipping is the key to cement distribution, due to the large cost benefit when compared with rail and road transportation. Cement transported on domestic waterways has almost reached the same size as seaborne volumes. Countries transporting the largest volume of cement using domestic transportation are Japan, Indonesia, South Korea,Taiwan, India,Vietnam and Australia. Not surprisingly, these countries also have some of the largest self-unloading cement carrier fleets and in Japan at least 75 self-unloading cement carriers over 2,000dwt are in operation for coastal services. In Indonesia, there is at present a fleet of about 50 vessels and it is rapidly expanding. South Korea has a fleet of 30 self-unloaders over 2,000dwt, although the demand here has been decreasing for the last few years. In total, these three Asian countries account for more than 50% of the world’s fleet. Other large fleets exist in Cyprus and Malta, but this has nothing to do with the demand in these countries, it is a result of the flag chosen by ship-owners for economic reasons. With a current fleet of 18 vessels owned and 3 other operated KGJ Cement (Kristian Gerhard Jebsen Group) is one of the largest independent owners and operators of self-discharging cement carriers, worldwide. Its ships are from 1,725 to 28,980dwt size, and the largest use combined pneumatic and mechanical discharge systems, whilst in the smaller to medium range pneumatic discharge dominates. This is also true for Baltrader Schifffahrt (being a part of Brise Group), which currently operates a fleet of nine modern cement self-unloaders with pneumatic discharge, ranging from 2,200 to 6,800dwt. It should also be noted that these self-unloaders very often carry fly-ash or ground blast furnace slag as well as cement. In the last few years, cement self-unloaders with pneumatic discharge have become more popular than mechanical systems, because they can be fully automated and are almost 100% reliable. Pneumatic discharge systems can be used on all ship sizes and are combined either with downstream pneumatic or mechanical system, or a combination thereof. Systems that can only discharge mechanically over the ship’s side to load trucks directly are used for small or mini cement distribution terminals. For larger cement terminals with annual throughputs in excess of 0.1mt (million tonnes), the standard is for silo or storage systems, which include packing, cement mixing, truck and or railcar loading systems. These silos are mostly some distance from the berth and at least one pipe system is needed to transport the material from the ship to the storage silos. Self-unloading cement carrier’s equipment has to fit in with different ship-to-shore transport distances and materials as well as high loading and unloading rates of up to 1,000tph to reduce the time that the ship is berthed. As the transportation market has become more competitive, there is a greater focus on the operating and maintenance costs of the self-unloading system and maximizing the utilization of the ships hold, to reduce costs. The different systems on the market each need a certain amount of space which reduces the ship’s gross cement cargo capacity. These cargo losses can be significant and require a careful analysis of the different designs for each planned ship size. Additionally customers require automated systems which can be handled by the ship’s crew to reduce stevedoring and labour costs. IBAU HAMBURG is one of the few suppliers which is capable of designing and supplying both onshore and offshore transport systems (Fig. 2 on p38), including shiploading systems, self- unloading systems and silo/storage receiving systems with a number of different technology options. Terminal projects can be handled either turnkey, including the plant engineering, manufacturing and delivery of mechanical and electrical equipment, automation, steel construction, building design drawings, installation, commissioning and testing or can deliver elements of the project such as engineering and supply of equipment. Its experience of cement storage installations includes flat storage, dome storage, steel silo and concrete silo design. For large volumes the IBAU Central cone silo design was introduced to the market in 1975 and since then several thousand have been installed. For cement self-unloaders, IBAU has introduced the light midship tunnel concept. In this unique space-saving design, cargo holds are divided into a portside and starboard compartment. The compartments are equipped with fluidization panels (Fig. 3, right), which are very similar to those in IBAU Central cone silos. The ship length is divided into separate holds and each hold bottom is covered with slightly inclined panels. When the panels are aerated, cement flows to the lowest points in the hold, where IBAU flow-control gates are installed, to allow adjustable, computerized cement extraction from the holds. In the midship tunnel the extracted cement is collected by an IBAU pump for downstream conveying to the storage facilities (Fig. 4, below). While other solutions use a vacuum system, pressure tank system or screw conveyor system with downstream pressure vessel conveyors for transporting the cement from the hold to the shore terminal, IBAU uses the screw pump concept for direct ship to shore transport. One pump transports a maximum 350tph of cement with conveying distances of more than 500m. For larger capacities a series of pumps is used. IBAU pumps need little maintenance with only bearing oil level control, packing box and wear of the screw end-flight needed. Worn parts, including the packing box and end-flight are easy to replace. Cement loading into the self-unloader holds can be direct or indirect. For direct loading, pneumatic systems are used, which convey the cement through one or more pipelines directly into the cargo holds. Flexible hoses for the connection of the shore and ship pipes are carried by an onboard crane (Fig. 5 on p40). Loading lines on deck are equipped with motor actuated IBAU two-way valves for directing the cement into the selected holds. For cement distribution from an on deck central loading device either fluidslides or horizontal screws can be used. In the IBAU concept cement loading and reclaiming is completely automated and computer controlled. During loading, cement is automatically directed into the holds, while the ship is balanced. Unloading rates can be pre-selected and the operator gets continual information about the state of the hold and discharge equipment. IBAU HAMBURG can fit the computer systems with latest state-of-the-art technology to ensure highest possible through the hold capacity with the shortest lay-time for the ship in port. In principle there are four different types of self-unloading systems, which are based on pneumatic cement extraction from the ship’s hold — the pressure vessel system, combined vacuum/pressure system, combined screw conveyor/blow tank system and midship tunnel/screw pump system. The pressure vessel or three-tank system uses a separate suction tank with integrated filter, which is installed on top of two or more pressure vessels for continuous operation. In the vacuum/pressure vessel system, two tandem blow tanks work in a quasi-continuous way. The cement is sucked by means of vacuum pumps from the holds to the blow tanks. In the combined screw conveyor/blow tank system instead of a vacuum system the blow tanks are fed by vertical screw conveyors. In the midship tunnel/screw pump systems, the cement is transported to the screw pump, which is able to convey cement over distances of more than 500m with vertical and horizontal piping. The space requirement in the ship’s hold is very low with the IBAU midship tunnel/screw pump technology, because the midship tunnel takes up only very little space and the pumps for the ship-to-shore transport have a very low feed point. The power consumption that is required for an IBAU pump is no higher than for a combined vacuum/pressure vessel system and only slightly above screw systems for medium and long distance. IBAU HAMBURG has completed a study on the space requirements for its system, which showed that with the midship tunnel concept the space loss is a maximum of 15% of the ship’s hold. This space loss reflects the complete cement handling system with inclined panel aeration system, midship tunnel for the conveyor and flow control gates as well as a small bottom- to-deck hold for the downstream discharge equipment. The maximum space loss of the IBAU system compares very well with all other systems, which have a larger space requirement. Nevertheless it is suggested that ship-owners/operators do a comparison for their preferred ship size. Another strong point of the IBAU pump is the adaptability to latest automation requirements. Self-unloaders can operate under any weather conditions. During loading and unloading the cement is always enclosed so that the environment is not exposed to cement dust. There is no contamination of the cargo by water or cargo residues. In cases where different cement materials have to be transported one after the other, a 100% cement reclaim from the cargo holds is achieved by the optional IBAU vacuum cleaner. The cargo holds are equipped with docking stations for the cleaner, which transfers the remaining cement between aeration panels into the bin of the IBAU pump. Particle separation is effected in the pump filter and no additional cement transportation equipment is needed. The IBAU project list comprises new builds as well as conversions. The Goliath (Fig. 6 on p35) is an example of a completely independent cement vessel. The 15,000dwt cement tanker is operated by CSL Australia (Canadian Steamship Lines Australia). Each year, the vessel transports more than 1mt of cement from Devonport Harbour (which is near the Railton cement plant) to cement terminals in Port Melbourne, Glebe Islands (Sydney) and Newcastle. For loading, the shore-based pipes are connected via flexible hoses to the vessel’s cement distribution system. The required compressed air for the cement transfer is generated by compressors on board. The appropriate cement tanker hold is selected from the ship’s central control room to achieve stability. Loading capacity is 1,400tph with four shore-based IBAU pumps, unloading is via four IBAU pumps with 1,200tph and 300m conveying distance. A typical conversion is the Cemstar (Fig. 7 on p40) (formerly Lisa Lehmann) with 2,000dwt cement capacity and two holds. Loading is either done by a shiploader with loading chute for 300tph or directly from road tankers. Unloading is done via an IBAU pump which delivers 150tph over a conveying distance of 265m. Cement is transported directly from the ship into storage terminals. This conversion was completed in just three months. The Cemstar is operated by Baltrader Schifffahrt. This year the company awarded IBAU HAMBURG another contract for the Cemsea III, which will have a 6,000dwt cement capacity and will be equipped with an IBAU pump, size 350, which can achieve an unloading rate of 300tph. Cement self-unloaders with the IBAU midship tunnel design fulfil the most stringent system requirements and allow a maximum utilization of the ship’s hold. Installation times for such systems are relatively short and the operating and maintenance costs are low when compared with other systems. IBAU HAMBURG has extensive project experience with ship sizes of 2,000–20,000dwt. Projects include new buildings as well as ship conversions. These cement tankers are adapted for different terminal facilities and depending on the ship’s capacity and equipment are able to handle high loading and unloading rates of up to 1,000tph. In the past, long discharge booms were the norm on gravity self- unloaders, and this was true of the many recent newbuilds completed by EMS-Tech for several high profile shipowners. The shipowners, as with the ones in the past, demanded this solution as it allowed them to both build large stockpiles onshore and service the greatest number of port facilities with varying receiving systems. In recent years, however, some of the traditional self-unloader trades have disappeared as the world market has struggled under an excess of available shipping capability. At the same time, transloading systems have found a niche, especially in undeveloped areas of the world where there is little to no shore infrastructure. Rather than construct an expensive port facility, or dredge to allow larger vessels to service an existing port, a fully mobile transloading station can be a much more economical solution. Most transloading systems today feature a raised telescopic shiploader boom rather than a fixed length boom. This provides the necessary loading flexibility as well as the height necessary to load Capesize ocean going vessels (OGVs), the vessel size of choice for movement of materials on long distance routes. Long discharge booms are less than ideal for transshipping, because the boom length is excessive for trimming and continuous ranging of the transloader alongside the OGV. In 2010 EMS-Tech was contracted by CSL Australia to design and supply material handling system upgrades for its gravity self-unloader CSL Sams to convert it for transloader service to load iron ore to Capesize OGVs. The original material handling system worked reasonably well, but the discharge boom was too low to the deck to provide the lift necessary to reach over the decks of larger vessels. Another issue with the CSL Sams was the fact that it was fitted with roller track style cargo gates below the cargo holds, and these would not provide a reliable steady stream of iron ore to the conveyor system. Discharge to the conveyor system would be erratic, spillage would be excessive, and overall performance poor. One of EMS-Tech Inc.’s many success stories has been the introduction of the patented Feeder Gate system approximately ten years ago. The Feeder Gates guarantee a steady flow of cargo out of the holds, even when the cargo is extremely wet and sticky or very dry and fluid. To date, over 1,000 Feeder Gates have been installed and are working on self-unloading vessels around the world, and these gates allow the discharge rate to be fine-tuned to suit the receivers demands, be they small or large. Much like a ‘choke feeder’, the gates are allowed to be open and the material is simply pulled out by the variable speed conveyor as required to meet discharge demands, free of spillage and dusting. The Feeder Gates on the CSL Sams, renamed the CSL Whyalla after the conversion, allow the upgraded material handling system on this vessel to discharge iron ore at a precise rate of 4,200tph (metric tonnes per hour). Substantial upgrades to the system were completed to increase the capacity of the system from 2,500tph to 4,200tph and to increase system reliability. The original 40m-long discharge boom was removed and replaced with a 50m boom which can either elevate material to a new pedestal mounted 39m telescoping shiploader or discharge directly to shore. The new 39m-long shiploader quickly and effectively loads and trims cargo into the Capesize OGV holds with a minimum of ship movement. The above deck system is fitted with dust control equipment to suitably address environmental concerns which exist both at the port of Whyalla and across Australia in general. 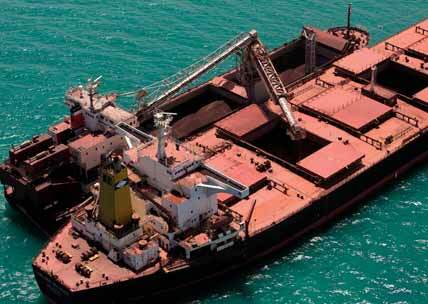 The Whyalla acts as a transshipment shuttle vessel (TSV) and provides extra flexibility to the existing Whyalla ore export operation. She is fitted with two bow thrusters and two azimuth thrusters for precision manoeuvring. The Feeder Gates ensure a constant feed of cargo to load the OGV as quickly as possible. The system is currently on target to transship 6.5 million tonnes in the next fiscal year. The CSL Whyalla is one of a growing number of self-unloaders retrofitted to work as transshippers. However, there are issues to be dealt with when converting a vessel. One of the main concerns is to make sure that the system is sound enough to be operated at sea under dynamic pitching and rolling conditions, since most self unloaders were only designed to operate at berth. Precise engineering is required to ensure transshipment is possible. EMS-Tech Inc. is pleased to be a part of this project and that this project is now delivering material in a reliable manner as expected and demanded by both the shipowner and the iron ore exporter.